Let's cut to the chase. 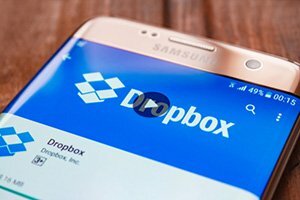 Should you buy Dropbox (Nasdaq: DBX) stock? Money Morning Chief Investment Strategist Keith Fitz-Gerald has dozens of reasons why you shouldn't. He's not a fan of initial public offerings (IPOs) in general. And Dropbox is just another over-hyped company in a long line of "oversubscribed," "in-demand" public offerings that aren't worth the paper their stock certificates are printed on – not that they still print them anymore. Newly minted tech companies like these are a dime a dozen. While the company may be doing alright, as a publicly traded stock, it hasn't created any sort of track record. We have no idea how the market really values each share, and as such, it has no place in an investor's portfolio. That does not mean these companies have poor businesses, but we really won't know until they get a public quarter or two under their belts. Don't be fooled by the underwriters' window dressing. Remember Twitter Inc.'s (NYSE: TWTR) IPO in 2013? It was supposed to be the next best thing in social media, and analysts fell over each other raising their price targets. The stock was issued at $26.00 per share, closed at $44.90 on it first day of trading, and then scooted to $74.73 a few weeks later. But that was all she wrote, and Twitter stock spent the next 29 months in a bear market. It hit a low of $13.72 nearly one year ago. Urgent: Historic event will unleash windfall profit opportunity – this eye-opening video divulges all the details. Had investors waited a quarter or two, they would have seen the stock's true colors. But back to the stock in question, Dropbox. Where exactly is all the growth the underwriters were touting to retail investors? The $9.2 billion valuation for Dropbox at its IPO was $800 million lower than a 2014 funding round reportedly valuing the company at $10 billion. In other words, even with all the hype and salesmanship, the company was worth less than insiders thought it was a few years ago. The stock since surged to an $11.2 billion valuation, but with four years behind it, the number shouldn't be hovering near the flat line. Dropbox's revenue jumped 40% from 2015 to 2016, but only 31% from 2016 to 2017. Fitz-Gerald thinks this year the company will come in at 25% or even less. You see, the vast majority of its roughly 500-plus million users don't pay for the service yet still enjoy benefits. To be worth the risk, the company would have to turn in at least 20%-plus growth, consistently, year over year. Forget about that happening. It's a mystery why people think companies like Dropbox are so special. Dropbox is just one in a long line of "collaborative applications" that let people work together online. The competition includes Alphabet Inc. (Nasdaq: GOOGL) and Amazon.com Inc. (Nasdaq: AMZN), both of which much deeper pockets. Fitz-Gerald is suspicious of these IPOs for another reason. The way they are structured seems to serve as the founder's way to cash out rather than raise money for future growth. That's why many of these offerings spike higher for a short while, as starry-eyed investors rush in to play the greater fool.